1 pack 40th birthday crown. 1 pack 40 birthday sash. 1 pack letter flag Cheers to 40 years. ✅ We provide a complete set of 40th birthday party supplies! ✅ Charming and refined 40th birthday gifts for her，making her look like a queen. ✅Make every beautiful moment, beautiful day is our mission! ✅Customer experience is our top priority! ✅ If you are not completely satisfied with these , return for any reason and get a full refund! The perfect birthday set, make it your 40th birthday decorations. Click on "Add to Cart" for your 40th birthday party ! 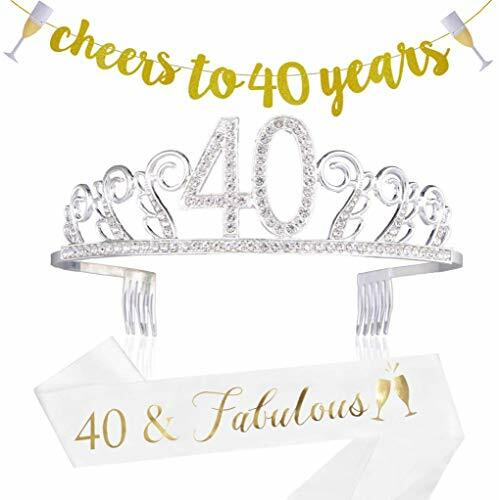 Shiny birthday crown is most loved by women, it's perfect for 40th birthday decorations, to make her more charming and outstanding in the crowd. Birthday crown size: this pretty happy birthday crown tiara is in free size, fits most women. Material: 100% eco-friendly alloy metal + crystals and rhinestones, nickel free and anti-allergic.Cheers to 40 years is a high quality cardboard material. If you have any questions about this product by Sllyo, contact us by completing and submitting the form below. If you are looking for a specif part number, please include it with your message.